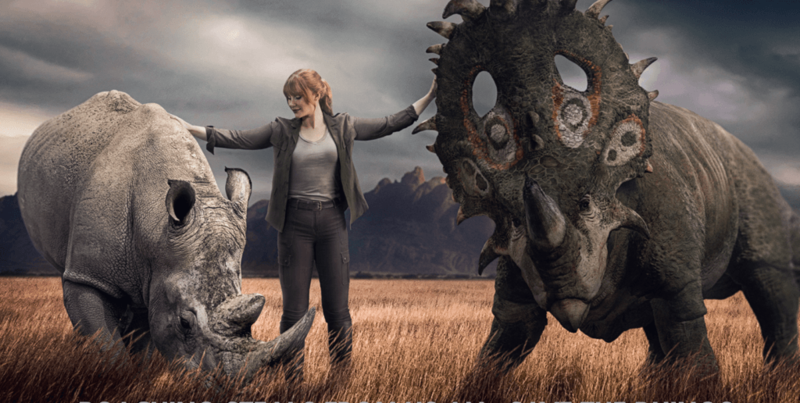 Shot on location during the production of Jurassic World: Fallen Kingdom, the PSA features Howard alongside the Sinoceratops—one of the incredible new dinosaurs featured in the film. Although dinosaurs became extinct 65 million years ago, the fate of the rhinoceros is firmly in human hands. While many endangered species are threatened due to loss of habitat to human expansion, African rhinos are solely threatened by demand for their horns for cures and carvings in China and Vietnam. There are fewer than 30,000 individuals of the five surviving rhino species left, and in March, the last male Northern White rhino, Sudan, passed away. WildAid’s rhino campaign, featuring Jackie Chan, Yao Ming, Li Bingbing, Sir Richard Branson, Prince William, David Beckham, Maggie Q and a host of prominent Asian stars, has helped to raise awareness and reduce demand for rhino horn. In the last three years, the price of rhino horn has fallen from $65,000 a kilo to around $22,000 a kilo. In Vietnam, rhino horn sales have been banned and awareness about the product has increased over the past few years: A 2016 campaign survey in Vietnam showed that just 23% of respondents believe rhino horn has medicinal effects compared with 69% in 2014, a 67% decline. Only 9.4% of respondents believe rhino horn can cure cancer, down from 34.5% in 2014, a 73% decline.